Dundee planners have recommended that planning permission be granted to a development of four mixed us blocks on the city’s waterfront containing a hotel, offices, homes and associated retail units. Fronting Riverside Esplanade to the south and Earl Grey Place to the north the Cooper Cromar designed buildings will be arrayed around a shared parking courtyard, drawing criticism from some of a diminution of the emerging V&A Museum, lack of street interaction and an absence of character. 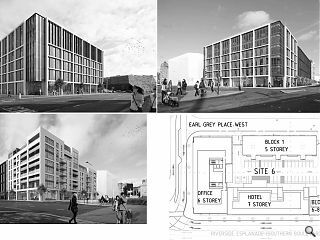 In dismissing these concerns the committee did push for some tweaks however, stating: “The initial submission gave rise to some concerns associated with the areas of blank wall to the north elevation of the west office block. Understandably the plant based function located within this section of frontage does not lend itself to active frontages. Other conditions include the creation of a public art project, details of vehicle access points, street lighting alterations and CCTV placement. I'm all for the continued redevelopment of Dundee's waterfront but I think there is the real risk of in the future looking back and seeing a missed opportunity to make something with real character and presence. Mundane banality is not an option! Dreadful - Look at the width of streets? It's Dundee not Santa Monica ?! Meanwhile schemes across Dundee promoted by the private sector have to reach the "high design aesthetic" stated has to be achieved by DCC Planning. One rule for DCC and another for the idigenous private sector developers. We need to be investing in the materiality of our buildings to bring quality and draw relationships with the character of our cities. 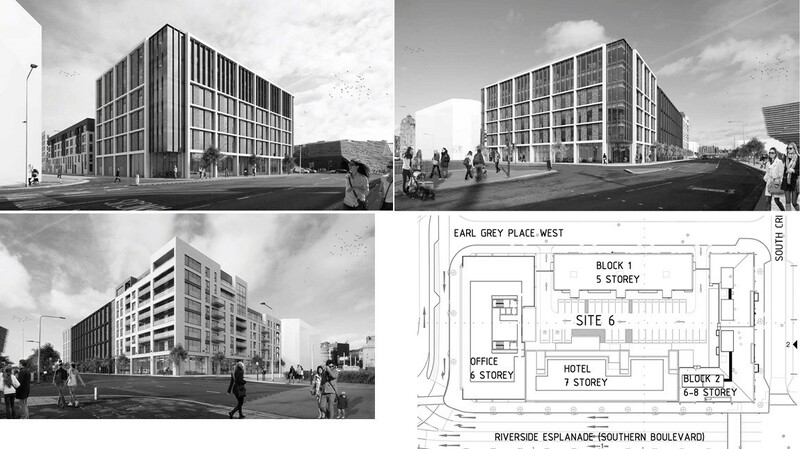 These proposals seem to be the usual mix from a generic, commercial pallette. Sorry to say that these elevations give no real sense of place or quality. Remember this is the east coast of Scotland and wide streets plus totalitarian design have no place here. It was not by accident that gables faced the sea in older towns and villages. The heights of these blocks will overwhelm the V & A and I can only think the plot ratios are driven by solely commercial considerations. Get a grip Dundee. You don't have to be cowed by some out of town developers and their lackey architects.